Want to win some rad things for your child’s school? Just shop Local for back to school it is that easy! What a great way to show your local and school spirit! No need to drag your kids into fluorescent-lit mega-stores to gather school supplies. Rather the local economy is here to meet all your shopping needs! Small business owners donate to school auctions and pay taxes all year ‘round to make sure our local kids feel the community love. 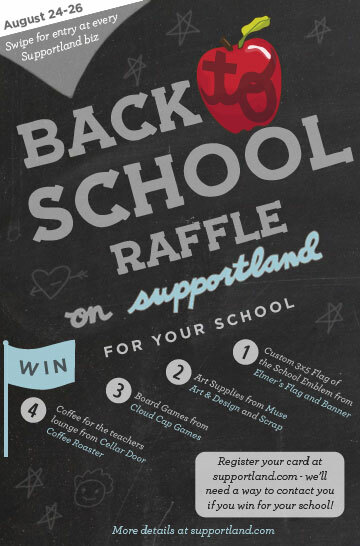 August 24-26 is a stellar time to give your kids the local warm fuzzies because Supportland is running a Back to School Raffle. Custom, locally-made flag for your kiddos school? How about some delicious coffee for the teachers lounge? Or top of the line art supplies and board games? Win fabulously for the school of your choice (up to middle school) by shopping local with Supportland’s Back to School Raffle. You get one entry per swipe (with purchase) at every unique Supportland business you visit during the raffle period, Aug 24-26. Did you know we have a new Supportland points incentive? A $30 book purchase here at Bolt will earn you 30 Supportland points! That’s our way of giving some points back to all our Supportland shopping folks. Shown above our book section full of great sewing books. Some links to past posts of book reviews. Stay tuned for new books and book reviews in the upcoming weeks.